Today seemed incredibly busy…I hardly know where to begin…OK, how about this morning. After a restless night at Wal-Mart, Petey and I went for coffee and oatmeal at McDonald’s. I’m not sure why sleep escaped me last night, as I was exhausted. Perhaps I started out a little hot, and it was a little bright and noisy in the parking lot relative to yesterday’s campground. On the plus side, my internet connection was MUCH faster and I got to pick up a few provisions before we took a three hour drive to El Dorado, Kansas. On the way out of town, we swung by the Coleman Theatre Beautiful built in 1929. One of its star performers was Will Rogers, part Cherokee. As we zigzagged across the back roads of Kansas passing by croplands, grazing cattle, and even a few oil wells, I couldn’t help but wonder if I’d ever see a hill. 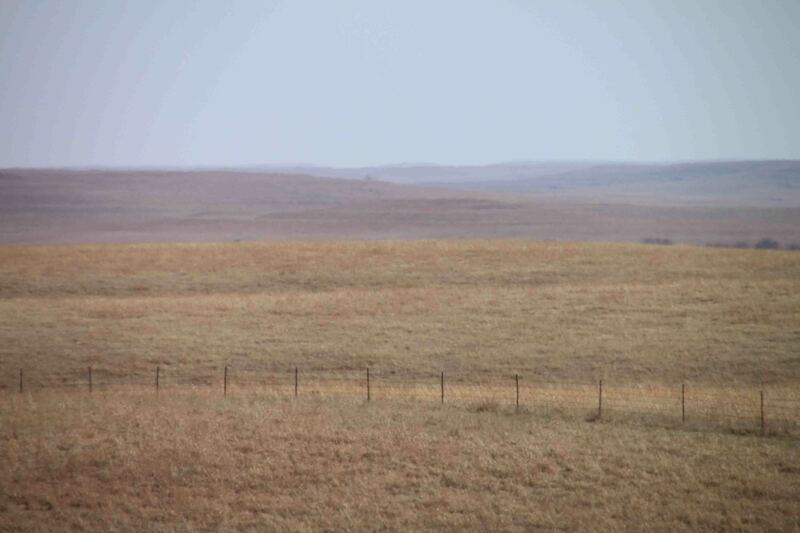 The frontiersmen with their horses and wagons must have been happy to find Kansas…only flat prairie land to traverse. I also wondered why there weren’t any wind turbines around. The windy plains seemed like an ideal spot for them. I’ll leave that up the wind powered energy engineers. Petey and I made our first stop of the day (after lunch) at El Dorado State Park to explore the Walnut Ridge Hiking Trail which connected to the El Dorado Linear Trail. Petey liked the linear trail which was wide and paved with lots of smells and no thorns…he’s a city boy. I preferred the hiking trail that weaved through the bare trees and crossed a dry creek. We watched the birds flutter from place to place and even picked up a “micro” cache called Walnut Ridge Bridge. Given the name and its categorization as “micro”, I expected a small magnet stuck to the metal bridge. I was wrong and made the grab much harder than it should have been. Of course it would have been easier if the trees weren’t interfering with my GPS signal. On my way to Cassoday, the Prairie Chicken Capital of the World, I needed gas. I referenced Gina, my GPS, to find a station just off I-35. Yes, that is an Interstate in Texas, but a turnpike in Kansas. I wondered how much I’d have to pay to drive five miles for gas and return to the same location. As I pulled through the entrance, I glanced at the ticket with the printed fees and exits. After a few choice words, I hoped and prayed I didn’t have to drive 40 miles to Emporia before I could turn around! Luckily I was able to U-turn through the service station and return to Cassoday for only 25 cents. Between Cassoday and Cottonwood Falls, I pulled into a “scenic viewpoint” on Highway 177 offered a scenic view. I had to pull off. I couldn’t imagine what I’d see beyond rolling grasslands. Posted around a sidewalk roundabout, were five signs describing different attributes of the Flint Hills region. I must be entering the “hilly” part of Kansas. According to the signs the limestone, shale, and chert that make up the Flint Hills were once a sea bottom. Purple, orange, yellow, and white wildflowers grow on the hills. While large herds of buffalo no longer roam freely, the prairie is still home to pronghorn, deer, coyotes (in fact I saw one earlier in the day), prairie dogs, and small creatures. Over 200 types of birds have been spotted in the hills. And finally, sometimes the tall grass isn’t tall because cows eat it, the nutrients might not suffice, or it might be mowed. No joke…I read that on a sign! Cottonwood Falls has been the Chase County seat since 1859. The first log cabin courthouse was replaced by an enormous building of limestone and walnut and capped with a steep red roof and cupola. It is the oldest Kansas courthouse still in use. The interior walls are decorated with framed black and white photos of the small, surrounding town. Many photos capture residents wading through the main street in a flood. The courthouse seemed grand enough that I thought it might be a virtual cache. It wasn’t, but another cache was hidden at the other end of the three block town at a bridge overlooking the Falls of Cottonwood. The bridge has an interesting history. Cottonwood Falls was passed up by the Santa Fe Railroad. Instead it stopped two miles north in Strong City. This twin city situation led to a trail to connect the two cities first via horsecar and later with a motorized vehicle. The bridge, constructed in 1914 for $13,400 was used be vehicles until the 1970s until it was closed. The bridge was restored and reopened in 2007 to foot and bike traffic only. If it weren’t for geocaching, I would have passed right by and missed the area’s history…another example of why I like caching. We continued a few more miles up 177 to the National Tallgrass Prairie Preserve previously the Z Bar/Spring Hill Ranch. According to local legend, S. F. Jones came to Chase County from Colorado in 1878 “with money sticking out of every pocket”. Jones constructed an elaborate limestone mansion as well as a three story barn, one of the largest in Kansas at the time. He wanted his cattle to graze on the fine prairie land. Petey and I took a 1.75 mile walk through the grasslands. As I meandered along the winding trail through the field, I thought it surely would have been fun to randomly weave through the pasture on a riding mower, plow out a path, and say, “Okay tourists, here’s the 1.75 mile nature trail”. There truly didn’t seem to be much rhyme or reason to the path except to allow people to pass through waist high grass on either side of them. We ended our day’s journey in Council Grove, some 15 miles north. On our way, we passed by a yard sale as noted by the bright pink sign and purple balloons attached to the mailbox. There wasn’t another house within three miles of the yard sale. I wonder how many patrons looked for a deal. After a fried chicken dinner at Hays House 1857 Restaurant, named for Seth Hays, a great-grandson of Daniel Boone, who began a business serving food and trading goods on the Santa Fe Trail in Council Grove, I located a campground at Council Grove Lake where I met Joe. Joe braved the lightning filled sky, rain, sleet, and snow flurries to fill me in on the campground. RV’s were parked at four or five campground slots. His son parked next to him and his in-laws were next to his son. I parked in an empty space between Joe and his cousin. His son and in-laws live in Topeka. Joe lives in Paxico between Council Groves and Topeka. He and his extended family spend every spring break here at the lake. He comes down here to fish quite often in the summer, but it is too cold now. hehehe Regarding the truck with the … “ornaments”… hanging off the back, our Jeeping/Geocaching group make fun of that type of stuff on our CB radios as we drive down the road. I couldn’t resist. What seemed even more weird to me was it was four men together touring a house and barn!? !